NYC Police Deaths: Details On Suspect; Rift Between Mayor And Police : The Two-Way New York Police Commissioner Bill Bratton says tensions in the city are at their worst since the 1970s. He spoke two days after Ismaaiyl Brinsley shot and killed two police officers in New York. 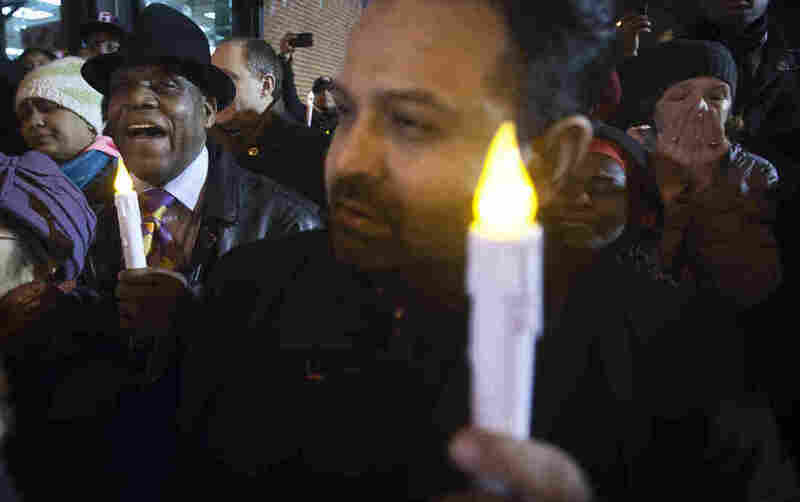 People sing as they take part in a prayer vigil at the site where two police officers were shot to death in the Brooklyn borough of New York this weekend. New York Police Commissioner Bill Bratton says tensions in the city are at their worst since the 1970s. Bratton spoke two days after Ismaaiyl Brinsley shot and killed two police officers in New York. Brinsley had been arrested at least 19 times and reportedly had tried to hang himself last year. In a news conference Monday afternoon, members of the NYPD and Mayor Bill de Blasio called on the public to send in any information about the suspect in the hours before the shooting, saying there is about a two-hour gap in the investigation's timeline. On security since the incident, Bratton noted that police believe the shooter acted alone. He did say the NYPD has received "copycat-type threats" that are under investigation, but that there is nothing "of significance" so far. The tragic shooting has also exposed fault lines in the relationship between de Blasio and the city's police department. Bratton has brushed off questions about the tension, calling such a conflict "nothing new." Officers Wenjian Liu, 32, and Rafael Ramos, 40, are being mourned in Brooklyn and beyond. The New York Times notes that Liu was married just three months ago, and Ramos was a good dad and neighbor who had once planned to be a chaplain. Police leaders around the country are advising officers to wear bulletproof vests — and to "avoid making inflammatory posts on social media," the AP reports. Commissioner Bratton tells NBC's Today show, "Who would've ever thought, déjà vu all over again, that we would be back where we were 40 some-odd years ago? I think this one is a little different though, in the sense that [there are] social media capabilities to spread the word constantly." On the question of whether de Blasio owes police an apology for the way he handled the Eric Garner case, Bratton tells NBC: "I don't know that an apology is necessary. One of the things, a concern at the moment, is this issue is really starting to go down partisan lines Republican/Democrat. This is something that should be bringing us all together not taking us apart." Garner, who was arrested for selling single cigarettes last July, died after a police officer put him in a chokehold. "It is an attack on all of us. It is an attack on everything we hold dear," de Blasio said of Saturday's violence. He repeated those comments at an appearance today at a police charity event, urging events and protests planned over the next few days to be postponed until the funerals of the two officers. "It's important we put aside political debate, put aside protests and all of the things and all of the thing we'll talk about in due time," de Blasio said. Brinsley, 28, had numerous run-ins with police, New York Chief of Detectives Robert Boyce says, for offenses ranging from robbery to disorderly conduct. Brinsley posted on an Instagram account before the shootings: "I'm putting wings on pigs today. They take 1 of ours, let's take 2 of theirs." That post showed Brinsley was in Brooklyn; The Baltimore Sun reports that soon after it was posted, Baltimore County police contacted Brooklyn police and faxed a "wanted" poster of Brinsley, saying: "He is currently believed to be in the New York Area, possibly the Brooklyn area. Suspect is armed with a 9 mm handgun and has posted pictures of the handgun on Instagram saying that he will shoot a police officer today." Police from New York and Baltimore County, Md., are still waiting to speak to Shaneka Nicole Thompson, 29, whom Brinsley shot before traveling to New York on Saturday. Thompson is reportedly in critical but stable condition. On Saturday, some officers showed their anger at the mayor by turning their backs on him as he walked past. "There's blood on many hands tonight," police officer union president Patrick Lynch told reporters. "That blood on the hands starts on the steps of city hall in the office of the mayor." Member station WNYC's Brigid Bergin gives us this context: "As a candidate, de Blasio promised to bring reform to the NYPD. And as mayor he's started to do that, ending low-level marijuana arrests and beginning a wholesale retraining of the department. At the same time, officers have been working with an expired contract and negotiations with the city are at an impasse."